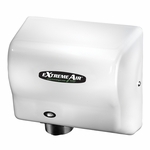 American Dryer ExtremeAir EXT7 High-Speed – ECO – No Heat Hand Dryer. The EXT series is the most energy efficient, environmentally-friendly hand dryer ever. White ABS Cover. 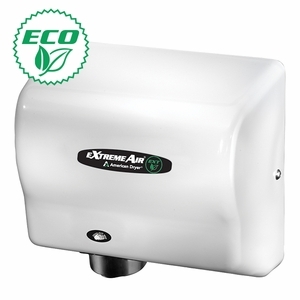 The 500 Watt ExtremeAir EXT7 is the first high-speed hand dryer to reduce power consumption to an industry-leading 500 watts. That’s up to 3X less power than other green hand dryers. It's 43% smaller than other high speed dryers, yet it’s just as powerful and uses less energy. The EXT series is also adjustable for environments which require less noise and runs on any voltage between 100-240V.